Customers are the foundation of our business, and our success stems from striving to achieve high customer satisfaction and service excellence. We provide window cleaning for commercial customers such as local council, property management companies, residential homes, offices and shops. We provide a regular and friendly domestic and residential window cleaning service for your home. Our workers are trained in all aspects of window cleaning. We remove the dirt and debris from your guttering and down pipes, flush them through to ensure the water flows away correctly. Let Angel Window Cleaners bring new life and a sparkly shine to your property making your home stand out from the neighbours. 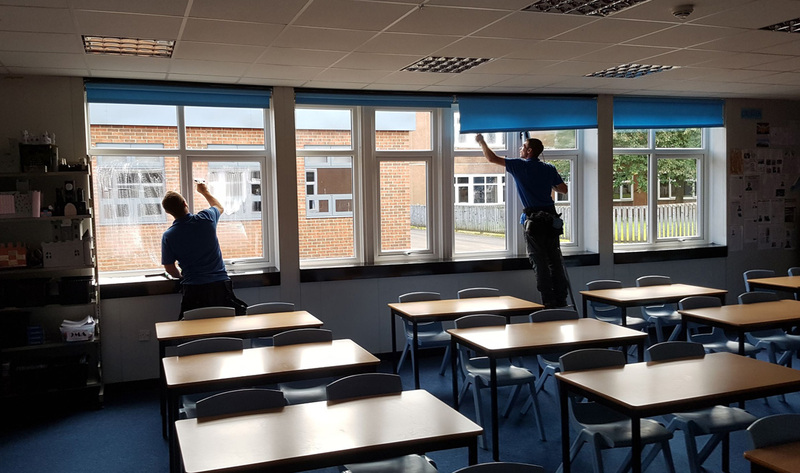 Reach & Wash systems allow windows to be cleaned from the safety of the ground using long reaching, telescopic poles ensuring safety and privacy. Angel Window Cleaners provide a professional and reliable window cleaning service in Gateshead and the North East tailored to your specific needs. 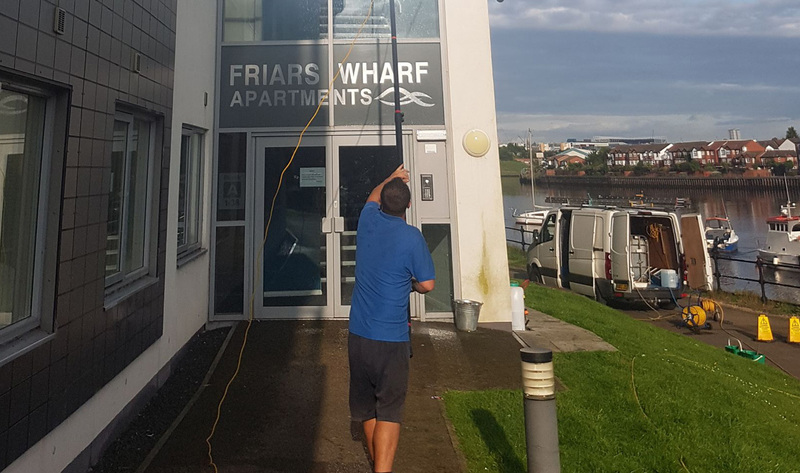 By using both traditional window cleaning methods and the high reach window washing system working with water fed poles our window cleaners offer a comprehensive and safe service for residential customers, high buildings and offices in Gateshead and the North East. Window cleaning can be potentially hazardous but you can be assured that we are fully compliant with all current health and safety legislation. We also constantly review our methods and procedures to ensure we are using the most up to date technology and equipment available. Contact Angel Window Cleaning today on 0191 440 9834 / 0796 843 5272 or email us at angelwindowcleaners@gmail.com for a free and prompt on-site estimate. "Angel Window Cleaners have been cleaning my property for over 10 years. They are extremely reliable and are always willing to adapt to my requirements. Both reasonably priced with professional well mannered staff, they offer all you need from a window cleaning company." "Our experience of Angel Window Cleaners is all positive. We have not had any issues with the service provided. The lads are always great, no disturbances and the window are always gleaming! Invoices are always in good time for accounts to sort out, as well as any queries dealt with quickly." "We have been using Angel Window Cleaners since 2016. They were able to accommodate us in our requirements at short notice. They always turn up when arranged and nothing is to much trouble. Their work is impeccable and the staff are always polite and courteous. No hesitation recommending this company to everyone." "Angel Window Cleaners have been cleaning the commercial property I work in for the last 15 years and do a fantastic job. A very reliable, professional and friendly company who never fail to deliver a 5 star job. I have recommended to friends and other businesses as the team are that good." "Excellent job every time. The lads are really professional and friendly. Quick balance transfer for payments. Would recommend 100%." Would you like a window cleaning quote? Please enter details to receive a free, no obligation window cleaning quote. It’s obviously important that you pay a rate that is competitive but it is also important to consider what you are getting for your investment. An Angel window quote will incorporate the required initial deep clean of your windows, frames and doors. Following on from that a regular maintenance clean of your windows cost. We utilize a number of cleaning methods from the traditional ladder, blade and pad to the water fed extension pole. We use different methods to suit individual clients and their property requirements. Angel Window Cleaning will always be punctual and courteous and leave your windows looking spotless. You can rely on Angel Window Cleaning to provide the purest clean you’ve ever seen! It is very important that all trades people that work on your property have adequate insurance. All Angel Window Cleaning professionals are insured.